Usually, I don’t read novels, but this master piece by Neal Stephenson got me hooked. It’s a brick of nearly 1000 pages, but I never once felt bored reading it. The setting is 15th century europe and Neal has made many of the royalties and scientists and other important figures of that time characters of his book. We get to know Isaac Newton and his German counterpart Leibniz, at the end of the era of alchemy. We get a lot of science, political and economy history along with a fiction story woven into that big setting. Fun, enlightening, awesome. The language of the book is very advanced, and since english is not my native tounge I certainly missed a lot nuances. Still, it was a hell of a read. Highly recommended. This title differs from other litterature I’ve read in that it goes right to the heart of agile, the planning process, and covers it in more depth than any other book on the subject. I found the chapters on estimating really useful, the advantages and disadvantages of using story points or ideal days, and why those are relevant only for the release planning and not for iteration planning (where ideal days are a better mean of measure). The pieces on prioritizing another thing that I’ll probably return to and re-read some day, for instance The Kano Model of Customer Satisfaction which was unknown to me before I read this book, as was the idea of using ranges as estimates. Agile Estimating and Planning is great, and a must read for all scrum masters and product owners, and it should also be quite valuable to anyone else who is interested in agile software processes. If you are, don’t forget to check out The original book on Scrum, and The only thing you need to read on Scrum. I am one of those who prefer rapid before well founded decisions. While many people I know weighs their options carefully, I usually take a quick glance at the situation and then pick a solution to go with. Thus, instead of doing all the thinking upfront I start acting but am prepared to change route in case new information comes up. I have noticed that even though I make most of my decisions on loose grounds they usually prove to be good ones. How come? What is going on in my brain that allows me to do it? According to Malcolm Gladway it’s called thin-slicing, an ability to sub-conciously act on fractions of information, an ability that all people posess. Malcolm’s book Blink – The Power of Thinking Without Thinking was an eye-opening read to me. And, the book is really easy to digest with a handful of interesting examples taken from real life. Highly recomended. My company is undergoing a slow transition towards using Scrum as the primary software development method. It is indeed a grassroot revolution emerging from development teams all around the company. About a year ago we in my team decided to join this movement and I – as I always do when I need to learn something new – went to the source to learn Scrum thouroughly. The source in this case is of course Ken Schwaber’s Agile Software Development with Scrum. 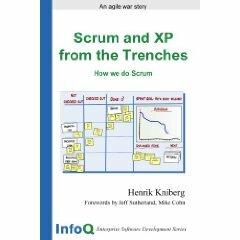 That book was great, giving me all the theory I needed to start implementing Scrum, but it was not until I’ve read Henrik Kniberg’s Scrum and XP From the Trenches that the picture became clear to me. This book throws out all the theory; You’re supposed to know the basics like what a product backlog is, daily scrums, etc. Instead this book is all about practical issues. What worked, what didn’t. Henrik gives you all his experiences in a very concise form that makes it really easy to digest – even for those in the team that has less interest in the subject. If you’re only goint to read one book about Scrum, this is the one! Get it. The PDF version is free of charge. The Pragmatic Programmer is supposed to be a classic read. Even Steve Yegge has put this book on top of his top ten programming books list. This is one of my favorite books on programming, although I burned through it in about 3 or 4 hours, and didn’t learn a huge amount from it. The point is that it was fun to read, it made a lot of sense, and it was helpful in reinforcing the habits I knew were good ones. I figured I had to read it too. Unfortunately it didn’t meet my high expectations and came out a bit too shallow for my taste. Like Steve I didn’t learn much reading it. At best I got a couple of new arguments for practises I already embrace. But, it was fun and easy to read so I still recommend it. Especially if you haven’t read many other books on software development. If you’re looking for a more inspirational read I recommend My Job Went To India by Chad Fowler. I bought this book because I needed to design and write my own theme for a new sports blog I wanted to set up. I prefer books over searching the internet when it comes to learning new things. I like having the information collected, filtered and packaged for easy digestion. Tessa Blakely Silver does that for me in her WordPress Theme Design book. I especially liked the design section, in which she proposes working with plain HTML only, with hard coded test data, and shows me how to do that effectively. I would recommend this book to anyone who isn’t a web designer already. For more advanced developers that are more interested in advanced WordPress specific techniques this book will most likely be a dissapointment. I bought this book to “lighten up” an order of several other books on heavier topics. Well, good thing I did since Chad Fowler‘s book turned out to be the most valuable of them all. To me My Job Went to India was as a source of inspiration, a confidence booster (since I already perform several of the suggested practices regularly), and an eye-opener.